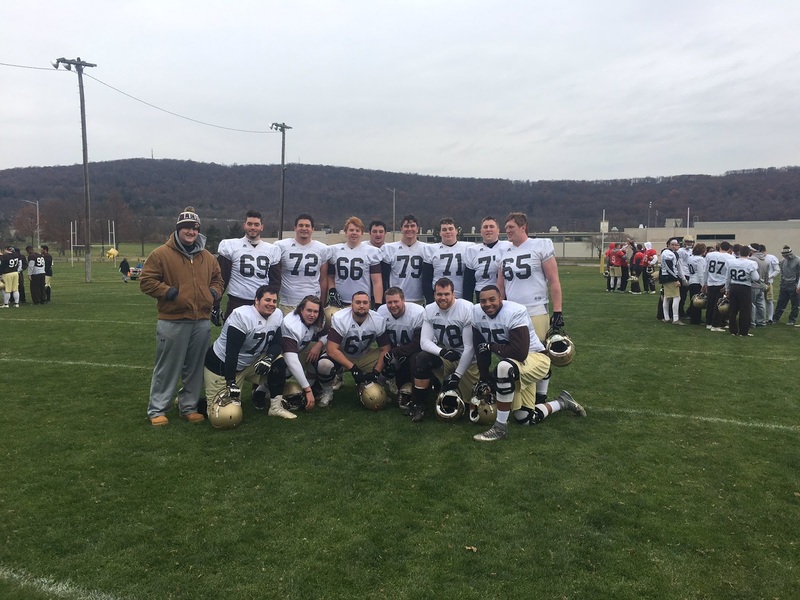 When the 2017 Lehigh Mountain Hawks released their very first positional two deep back in September, it had five freshmen and nine sophomores listed. That’s a fairly normal type of depth chart for a largely veteran team that was ranked in the FCS Top 25. Only two freshmen, OG Jackson Evans and LS Jack Dean, were expected to contribute right away, while sophomore FS Riley O’Neil had already started nearly every single game he’d played since his freshman season – already a veteran. Entering the ninth game of the season, the depth chart that head coach Andy Coen will present to the officials on Saturday will look very different. The two defensive captains on opening day, senior DT Jim Mitchell and junior SS Sam McCloskey, won’t be anywhere to be found – both injured, out for the year. Junior CB Donavon Harris – still out with a head injury. Junior LB Mark Walker – out. Junior ROV Nick Thevaganayam – out. Senior TE Drew Paulsen – out. Senior WR Gatlin Casey – most likely out. In fact, Lehigh’s depth chart will have on it eight freshmen, including four (WR Jorge Portorreal, OL Jackson Evans, C Chris Fournier, and ROV Divine Buckrham) who are starting. Additionally, five sophomores will be starting, including one, sophomore CB Marquis Wilson, who has only started one other football game. The 2017 season will be remembered not-so-fondly for the number of terrible, season-ending injuries that have freakishly occurred. And to close out the regular season, it is the next men up, a huge number of them underclassmen, that will determine the ultimate fate of this football team. One has been here before; the other has not, at least not lately. Over the course of the last few seasons, Villanova Stadium has hosted all sorts of games involving Top 25 teams. James Madison, New Hampshire, Richmond – all of these CAA teams have been to the Main Line, at one time or another, at the same time the Wildcats have also been in the Top 25. When it comes to hosting big football games, Villanova is no stranger to that situation. Sure, the Mountain Hawks have played a bunch of Top 25 teams over the course of the last several seasons. And last year, Lehigh returned to the Top 25 as well. But the Mountain Hawks haven’t hosted a game like this, a Top 25 tilt between two opponents that are both in the Top 25, since the Mountain Hawks beat New Hampshire 34-27 back in 2012. This year’s season opener represents the cumulation of the long, hard road of building a Top 25, national-caliber FCS football team. Last season was a year of a Patriot League championship, a return to national respect, and rings. And it all leads to this weekend, one of the biggest games on the Week 1 FCS National schedule that will provide a tremendous test to see how this 2017 Mountain Hawk team might turn out this season. “The Engineer football team once again showed their supremacy over the Yankee Conference leaders by defeating the University of New Hampshire (UNH) Wildcats, 16-3,” read the October 26th edition of The Brown and White in 1979. LB Jim McCormick intercepted a UNH pass early in the game, and returned it to the Wildcat 4, setting up an early touchdown. After that, the Engineer defense would take over, crushing UNH’s offense the rest of the way. That would be the last time Lehigh has won at Cowell Stadium – 1979, a year where Lehigh was one of four teams in the I-AA playoffs and made it to the championship, ultimately falling to Eastern Kentucky in the finals. So much has changed since then. The I-AA playoffs have been renamed the FCS playoffs, and not have 24 teams instead of 4. The Yankee Conference essentially was renamed to the Atlantic 10 Football Conference and now the CAA football conference, morphing from a Northeastern-based conference to one whose center of gravity is Virginia. New Hampshire went from a championship contender to a perennial FCS playoff powerhouse, seemingly guaranteed a slot in the playoffs every year. But what hasn’t changed much for Lehigh over the course of these last thirty-plus years is that Cowell Stadium has been Lehigh’s boulevard of broken dreams. The Mountain Hawks beat UNH in Bethlehem in 2013, it is true. But up in the Granite State, it’s been a different story. Since that epic 1979 win, Lehigh has been 0-7 up there, and not one of the games have been close. Perhaps you’ve heard that the Cubs, managed by a Lafayette grad called Joe Maddon, broke their more than century old championship drought vs. the Cleveland Indians last night. The Lehigh Mountain Hawks’ championship drought isn’t quite as long as that. But if the Brown and White hope to raise the trophy at Murray Goodman Stadium this weekend, they’ll need to break a mini-curse of their own. It refers to the Mountain Hawks’ inability over the last four years to win both Game 10 and Game 11 on the schedule, specifically during the last four years. There have been years that Lehigh has needed Game 10 to have a chance to win the Patriot League, but haven’t been able to get it done. There have been other years where they’ve needed Game 11 to do so, and missed. When Games 10 and 11 have title implications, and when Lehigh wins those games, they tend to be Patriot League champs. When they lose one or the other, there tends to be the type of hurt that the Indians got to experience firsthand last night. The Lehigh seniors almost certainly remember how that feels, on the potential last day of their playing careers at Murray Goodman Stadium. This quote, taken from the 1923 student newspaper detailing the first-ever official football meeting between Lehigh and Fordham, won’t be something that’s repeated in the student newspaer in their recap this weekend. In fact, the fifteen points scored in that 1923 game, a 9-6 Lehigh win, might very well be outdistanced in the first five minutes of the game this weekend., and it’s a guarantee that Fordham and Lehigh will be completing their first passes well before the 3rd quarter. It would be stunning to see a 9-6 final in this game this weekend in large part because all signs point to a game which will be a full buffet for fans of offense. 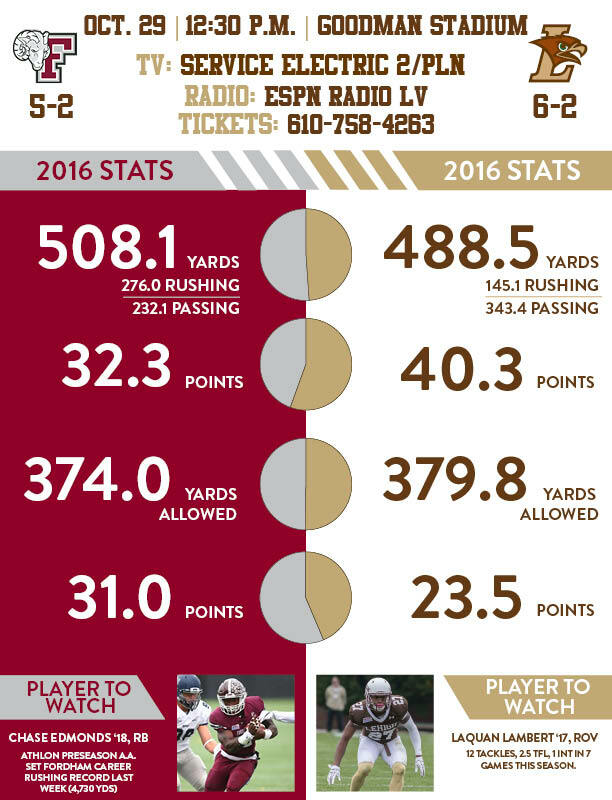 If Lehigh and Fordham meet their season averages for total offensive yards, there’s a chance that both teams’ offenses combined might exceed 1,000 yards, while Fordham averages 32.3 points per game, and Lehigh 40.3. Even if this game didn’t loom enormously in the Patriot League title chase – which, of course it does – this would be a terrific game to watch in terms of offense. No college football coach wants to face a team boxed in a corner. In that way, Harvard was stepping into a purple hornet’s nest last weekend when the nationally-ranked Crimson came to play the wounded Crusaders. After their injury-riddled team failed to hold onto a win against Bucknell, ultimately falling 21-20, Tom Gilmore‘s team needed to make a stand against a really good football team in order to keep their season from a limp to the finish. Even if they didn’t win, they had to keep things close – few pundits gave Holy Cross much of a chance against the better bankrolled, historically dominant Harvard team that hadn’t lost a road game a non-conference game in their last sixteen tries. Cornered like rats, Holy Cross responded in a big way. Six sacks and a second-half shutout later, the Crusaders would notch their first win over a nationally-ranked opponent since 2009, thus turning things around at the exact right time for them and the exact wrong time for Lehigh. Senior QB Nick Shanfisky called them “motivation games”, and it’s clear during this four game winning streak motivation hasn’t been lacking for this Lehigh football team. 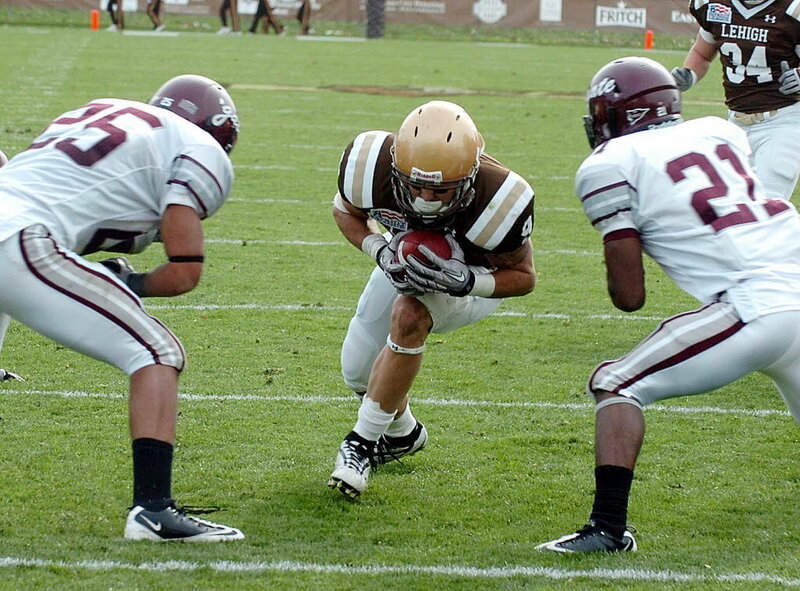 Start with Penn, where it was critical for the Mountain Hawks to avoid an 0-3 hole. Then proceed to Princeton, where the defense gave up 52 points last season in a loss; to the Yale Bowl, where two years ago no less than five players came down with injuries in another loss; and of course Colgate, where last season the Raiders’ stop at the goal line preserved their 49-42 victory and snatched a Patriot League title that was within the Mountain Hawks’ grasp. At 4-2, and in the drivers’ seat, along comes a game for Lehigh at Georgetown, which by any measure doesn’t have the same types of motivation that fueled this four game winning streak. Not that there’s no motivation, mind you. Conference games count for more than games against Yale, or Monmouth. But you can’t blame folks for looking at this Georgetown and fearing a letdown, a quintessential “trap game”. In the last four games, they were all motivation games – games fueled by either a desperation to get the season on track, or a continuation of track with a side order of revenge. This one is different – and thus, oddly enough, more dangerous. Admiral Ackbar might correctly identify this game as a classic trap. The word cloud around the Lehigh Colgate game the last decade has almost always involved the words “tundra”, “cold”, and “November”. So when the 2016 schedule was released, and Lehigh fans read “October 8th: Colgate”, many were disappointed, even as they still circled the game on their calendar with a maroon Sharpie. They were probably thinking back to last season, when, in the second weekend in November on a prototypical Lehigh/Colgate chilly afternoon with a chance of snow showers, the Mountain Hawks and Raiders were battling, essentially, for a Patriot League championship, ending up five yards short of a game-tying touchdown. But now, in what seems like a better move by the minute, the moving up of a critical conference game that has very often determined the eventual winner of the League seems terrific for not only both schools, but the entire Patriot League. That’s because, in a week that doesn’t feature many great FCS this week, the rivalry (with a little r) with Colgate will be the most entertaining, emotionally-fought game on the entire FCS slate. If there is one FCS game that will deliver some of the same emotions that Texas/Oklahoma will in the midwest this weekend, Colgate/Lehigh is that game. For one reason or another, I hadn’t been back. Since my undergraduate years, I hadn’t gone to see Lehigh play Yale at the Yale Bowl. It was either too long a trip as an undergraduate to catch the Engineers, a trip to Disney with the family interfered, or maybe I was just saving up my energy for a big conference game the following week. No matter what it really was, it really was a bucket of excuses, with the ultimate result being I hadn’t gone back, even though Lehigh had played there so often. It feels almost criminal, even though I have driven past the stadium many times. This weekend, for the first time since a beautiful night for football in October of 1977, I will be heading back to the iconic Yale Bowl. And in contemplating this trip, a flood of memories returned from my first trip there – my first-ever college football game, and thus the very first inspiration for what I would end up doing the rest of my life.